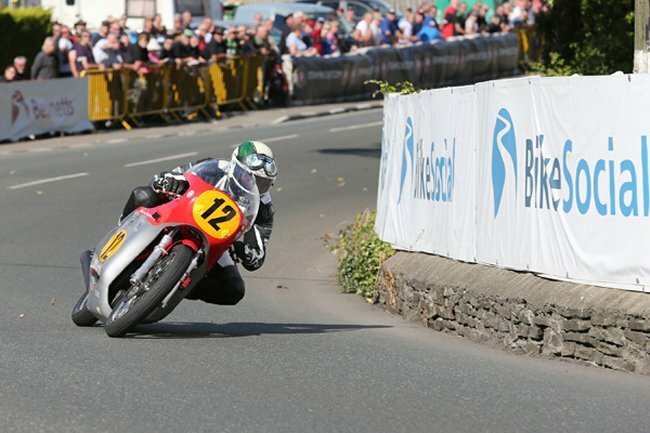 Twenty-three time TT Race winner John McGuinness, riding the Team Winfield Paton, won his first Classic TT Race in today’s Bennetts Senior Classic TT Race on the Isle of Man. The Morecambe rider, who has retired in his three previous attempts, set a new lap record of 113.342mph and race record in the process. McGuinness and Dean Harrison, on the Black Eagle Racing MV Agusta, were separated by fractions of a second on the opening two laps before a decisive late pit strategy by Team Winfield eventually saw McGuinness take the win by twenty seconds. The sunshine came out on the Isle of Man for the first race day for the Isle of Man Classic TT Races presented by Bennetts and conditions were reported as dry all round the course. John McGuinness was first away at 11.30am and was first on the road to Glen Helen and on time at the first checkpoint at Glen Helen, establishing a lead of 1.5 seconds from his nearest rival Dean Harrison, who won the corresponding race in 2015 with Maria Costello tucking into third a further seven seconds behind Harrison. McGuinness’s Team Winfield team-mate Conor Cummins on the second Paton was holding fourth with Alan Oversby on the Davies Motorsport Honda fifth, fifteen seconds behind the leaders. At the front of the field a close battle was developing between McGuinness and Harrison with Harrison edging in front at Ballaugh, only 0.162 ahead of McGuinness with Maria Costello maintaining third place but with the gap already extended to seventeen seconds from the leading pair. Conor Cummins was reported to have retired at Quarry Bends which saw Michael Rutter on the Ripley Land Racing Matchless moving into the top five at Ramsey where Harrison had extended his lead to 0.3 seconds while Ian Lougher, riding the late entry John Chapman Racing RC181 Honda was reported to have retired at Union Mills on his opening lap. McGuinness set a new lap record for the class on the opening lap 112.043 (20:12.289), which he held for less than a minute with Harrison clocking 112.077 (20:11.094), giving the Bradford rider a lead of 0.366 seconds. Maria Costello held third place with her opening lap of 107.499 (21:03.530) but was already over 50 seconds behind the leading pair. That remained the top three at the end of the second lap, but with Harrison having opened up a lead of over a second earlier in the lap, McGuinness ate into the lead and set a new lap record of 113.342mph (19:58.394) for the class. With Harrison slowing down coming into the pits, posting a second lap of 112.830/ 20:03.826, McGuinness established a lead of five seconds at the Grandstand at the end of the second lap with Costello third with her second lap of 107.846/ 20:59.462. Meanwhile Rutter had moved up into fourth place by Ballaugh on his second lap ahead of fifth placed Oversby. However, it was clear that Rutter had machine issues as he came in to the pits and he duly retired at the end of the second lap. Harrison’s pit of 46.973 seconds put the Yorkshire rider almost a minute behind McGuinness at Glen Helen on the third lap. Alan Oversby, like McGuinness, elected to run straight through at the end of his second lap, and edged in front of Costello on corrected time. McGuinness came in to the pits at the end of the third lap, with a ‘splash and dash’ stop of 40.218 seconds which meant that his lead over Harrison was down to just over twenty seconds at Ballaugh on the last lap once the pit stops had unravelled. However, the Morecambe rider maintained the gap with a last lap 108.196/ 20:55.385 to win his first Classic TT Race title by twenty-one seconds in a new race record of 111.559mph/ 1:21.10.189/ from Harrison (111.070/ 1:21.31.627). With Oversby coming in to the pits at the end of his third lap Costello duly moved back into the final podium place, which she clinched with a final lap of 108.686, which gave her an overall race time of 106.799/ 1:24.47.253. James Cowton, due to start 19, set off from the back of the field on the Dave Kennah Racing Norton following machine issues, made a huge effort to get to 6th place before retiring on his third lap at Signpost Corner. Dom Herbertson finished as the leading privateer in 6th place on the Herbertson Racing Honda in a time of 104.499mph/ 1:26.39.213. Hefyn Owen riding the Owen Racing 500 Matchless is currently the leading contender for the Peter Williams Trophy, which was created by Rob Ianucci, an enthusiast for AJS and Matchless race bikes made from a titanium conrod from the iconic ‘Wagonwheels’ machine. The trophy is awarded to the highest placed AJS or Matchless rider in either the Junior or Senior Classic TT races. 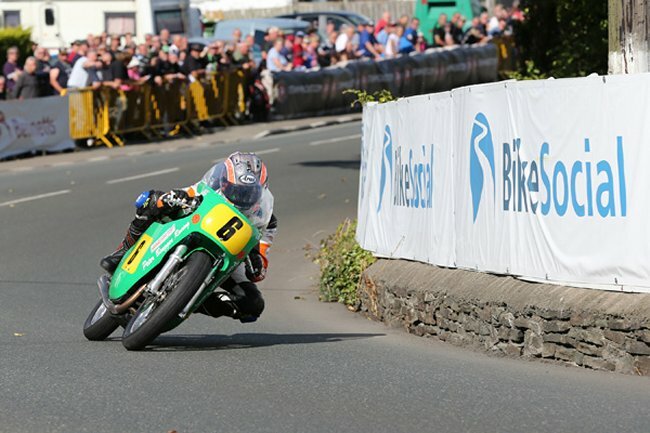 All eyes will be on Monday’s Okells Junior Classic TT Race to see if Owen’s 11th placed finish proves decisive.